It’s always a pleasure to see Blythe Danner in a movie. And it’s even more of a pleasure to see Blythe Danner in a good movie. No, not a good movie. A really good movie. Which “I’ll See You In My Dreams” actually is, its iffy (but explainable) title notwithstanding. The descriptives surrounding “I’ll See You In My Dreams” might read like trigger warnings to a dyspeptic movie maven. “Sundance hit,” “indie drama,” “senior romance.” I admit I myself went in with a slight amount of trepidation. But it was clear from the opening, in which Danner’s character, Carol has to put her beloved dog to sleep, that the 71-year-old Danner, was going to carry the movie, and that was…comforting. The long-widowed Carol has a pretty well-ordered life. She gets up early in the morning, does the housekeeping she needs to do, has a regular bridge game with some old friends who live at a nearby senior community, and so on. But she’s a bit disconnected from her friends, because she’s opted to live in a house of her own, and after the dog is gone, her life’s a little more lonely. Disorder enters in the form of a black rat in the house; Carol asks the new pool-cleaning guy, Lloyd (Martin Starr), to investigate. A weird, tentative friendship starts blooming between the aimless, bearded, much younger Lloyd and Carol. He takes her out to a karaoke bar where her long-lost identity as a singer reasserts itself in an impressive way, as Carol/Blythe really lays into “Cry Me A River.” The pair looks askance at each other when the idea of a romance rears its head—there’s an age difference of like four decades here!—but then you think you see them thinking, “Well, why not?” Before that question gets past the implied stage, Carol, after a disastrous senior-speed-dating session, accepts a date request from Bill, who’s played by Sam Elliott. Being played by Sam Elliott in itself implies a lot, and his Bill is a laid-back delight, taking Carol out on his boat, which he’s christened “So What,” after the Miles Davis tune. When Carol picks up the reference, Bill is duly impressed, and it’s, um, smooth sailing for their romance. Until it’s not. Co-written and directed by Brett Haley, “I’ll See You In My Dreams” is notable for its tempered sweetness and never on-the-nose wisdom. It makes genuine cinematic hay of scenarios that 99 out of one hundred other filmmakers would play for cheap look-at-the-old-people laughs. The aforementioned speed-dating sequence, for instance, is cut together with the conventional multiple-talking-heads interspersing, but it’s more purposeful and compassionate than any other scenes using that strategy I’ve ever seen. Similarly, a scene in which Carol, having decided to live a little, asks one of her girlfriends where she keeps her stash of medical marijuana, the ensuing scenes, featuring contemporary golden girls Rhea Perlman, Mary Kay Place, and June Squibb, are genuinely funny and touching, not to mention behaviorally accurate. One shudders to think how such material would play out in the hands of, say, Luke Greenfield or Greg Berlanti, but one doesn’t have to think of such things, as the material is so beautifully handled here. Carol’s new lease on life leads to her being nearly blindsided by a visit from her daughter Katherine (Malin Akerman). Their pleasant but wary interplay suggests hidden depths in their relationship, but here-and-now events detour their conversation, and then bring things to a new level. 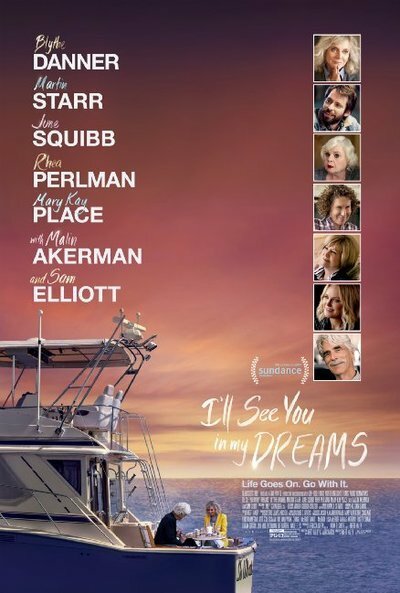 Unlike a lot of film-festival-friendly indies that emphasize character studies, “I’ll See You In My Dreams” has a very definite and sturdy narrative, and it’s a well-handled one that deserves to be discovered by viewers. While I was indeed moved by the film’s gentle conclusions with respect to life and aging, I was on the whole more impressed by how genuinely amiable the movie is: it’s an hour and a half spent with fictionalized people who are a real pleasure to “be” with. That is no small thing.